Trend is in favour of emerging markets and looks very strong for India – Shankar Sharma, First Global. On 12th September Shankar Sharma, who i am a fan of said that emerging markets are set for a major bull market. We went a little deeper to dig in the data points that suggest why he said what he said. We compared two Indexes MSCI Emerging market Index and MSCI World Index. MSCI World – The MSCI World Index captures large and mid cap representation across 23 Developed Markets countries. With 1,645 constituents, the index covers approximately 85% of the free float-adjusted market capitalization in each country. The MSCI Emerging Markets Index captures large and mid cap representation across 23 Emerging Markets (EM) countries. With 836 constituents, the index covers approximately 85% of the free float-adjusted market capitalization in each country. 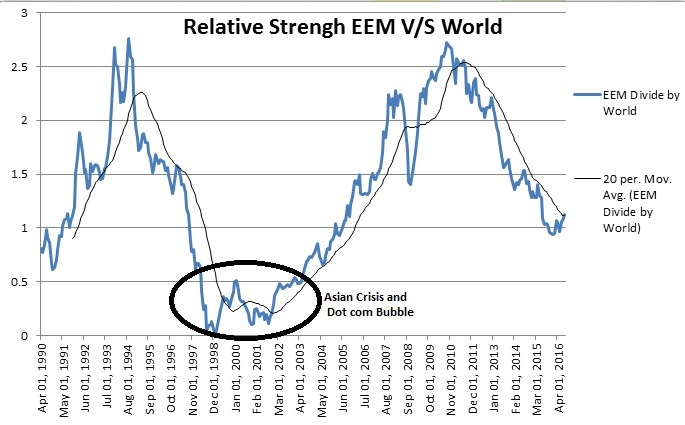 We did a Relative Strength study of Emerging Market Index and World Market. Emerging Market Index’s Relative Strenght against World Index has started gaining momentum as the Relative Strenght Index has crossed it’s 20 mont moving average. This is a sign of strength as you can see from 26 years of data that we have presented here. The above chart is of MSCI Emerging market Index.The MSCI Emerging market index was in a range between 35 and 45 for 4 years between 2011 and 2015. The Range Shift happened when crude prices went below 40$. Crude prices have bounced back and are consolidating between 40-50$. There is a Inverse Head a Shoulder pattern appearing on the Chart which shows bullish sentiments in the Index. The Above Chart is of MSCI EEM (Red) and Sensex Dollex 30(Black). Clearly there is strong correlation between the two. Sensex 30 is all Sensex companies in USD dollar terms, it is an proxy of gains of FII Investments in India. Conclusion – We are bullish on the prospect on emerging market index, infact this year economies which have struggled the most have performed the best like Brazil (+32%YTD). If Prices rise on Bad news, normally the price is right. We believe if MSCI emerging market ETF is to rally to 45, then Sensex dollex 30 can rally all the way upto 4000-4500.